Until server versions prior to 2.4 , the only way to have dynamic parameter values was to have those parameters defined as hidden. From version 2.4 you may have dynamic values also for visible parameters. NextReports engine recognizes "hidden parameters", meaning those parameters that are not visible at runtime, but which have default values declared in their definition. On the server, a report can run instantly or it can be scheduled to run at some moments in the future. 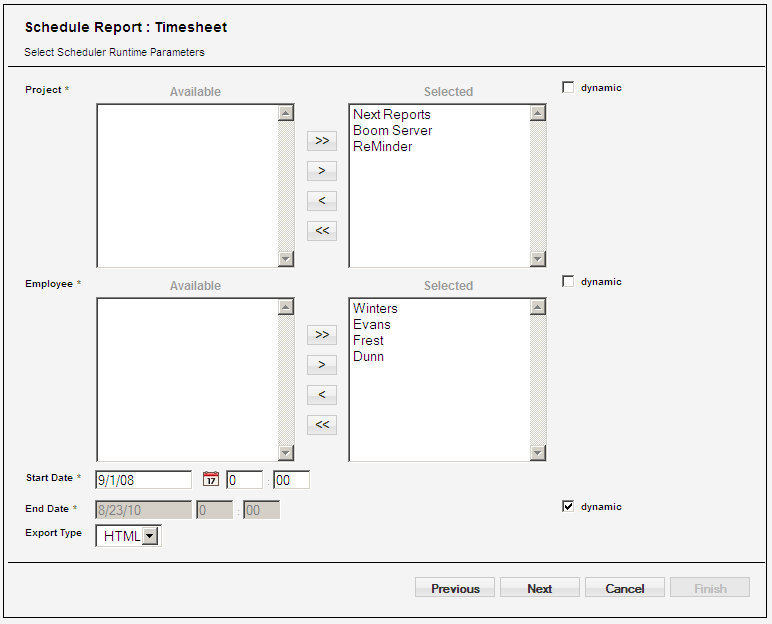 There is the possibility to want to run the same report instantly and also to schedule it. For some visible parameters with default values, we may have to "override" their values selected in user interface with default values computed at runtime. For these cases , the schedule process introduces a new property in parameter selection panel. If this property is false, the report will be executed with the static value(s) entered. If this property is true, the report will be executed with dynamic values, meaning the sql for default values is executed at runtime.